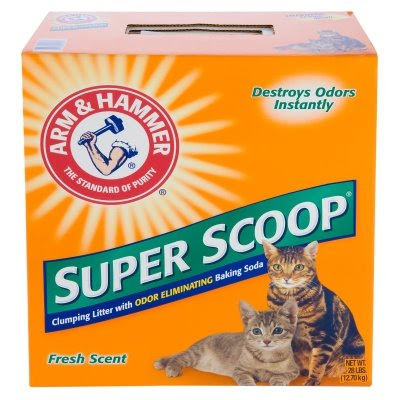 I was looking at the box of Arm & Hammer cat litter that we keep for Jeff, and it struck me how odd the pictures they put on cat products are when they choose to use photos. Cats just don't photo terribly well. Add in the fact that when cats ARE happy, they don't usually have a facial expression or body language to alert you to the fact that would be photographable. So on all cat products, they kind of depend on just getting photos of cats with piqued attention. Ie: they take pics of cats who are in hunting mode. Or, cats who are thinking of destroying/ killing/ maiming something. And that's a little weird. 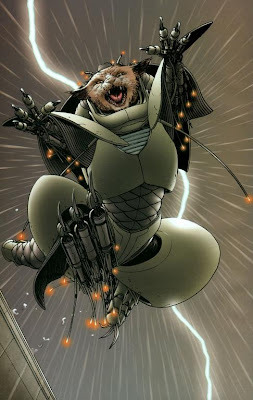 EDIT: here's some cat imagery that hopefully Jason will enjoy. The only thing on their minds is murder. I mentioned a while back that Stone Arch Books is publishing kids reader books featuring Superman (which you should BUY so your kids will grow up as right-minded people). Well, I particularly dig this deal. They had a contest to write about a hero at their school, and the winner was placed into a story with Superman. Pretty cool stuff. Read more here. Tip of the hat to Superman Homepage. Went over to Vivo tonight (off Manor) to have dinner with League-Pal Julia. Julia and I worked together at Enspire, sharing offices upon occasion (it was sort of tradition for producers at Enspire to change offices every few months), and becoming lunch buddies and outside-of-work buddies. Julia's pretty smart (she went to MIT), but not smart enough to not be my pal, so this evening, we raised a glass or two for JEP. I don't think she actually reads LoM, but if she did, I'd say "Happy Birthday, Julia Goolia". Also, I always forget about Vivo, but its really pretty good. I'm partial to it. Jonathan and Billie were there, too, for Leaguers who want to track their movements. Who Wants to Websling Down the Great, White Way? Nathan sent this along. It's an announcement about auditions for the upcoming Spider-Man Musical with music by Bono and The Edge. Click on the block about "Casting Calls". Apparently, they're casting in Austin. Which only makes sense. The producers obviously were looking for me to shave my head and play Wilson Fisk, the Kingpin. Because I look @#$%ing GOOD in a purple ascot. As a reminder, Sunday I board a plane for Minneapolis. For Leaguers looking to party down with a bunch of Library professionals, have I got a place for YOU. I'm happy to go. Sadder that its conflicting with what was supposed to be my birthday present (enjoy that ticket to Springsteen, Reed-o). But if my birthday plans weren't completely screwed, it wouldn't be my birthday. Although, on reflection, last year went well. Its just been pretty much every other single birthday since I turned 17 that's been lackluster. Ah, well. Once every decade and a half is pretty good, I guess. I would much rather be in Minneapolis hangin' with my bosses than seeing Springsteen rocking "Thunder Road". Yeah. Awesome. Maybe we can go to Mall of America and visit a Sbarro or something. Anyhow, blogging may be heavy if I'm just sitting in a hotel room. But if I keep getting shanghied by the dudes who sign my paycheck, I might not blog so much. Who can say? All I know is that it'll probably snow at night. And I'm ready for springtime. I was, of course, kidding about bailing when I wrote the April Fool's post (see, yesterday). For good or ill, we've no plans to shutter The League. Today I talked two of my co-workers into attending a "Learning Break" for Library staff on the subject of "blogs and RSS feeds". Our office offers a blogging tool for facult to use to discuss their areas of expertise, so I figured I'd see what the presentation was about, and how they were pitching use of blogs in libraries. It turned out to be a very, very basic course on what a blog is, and how to use an RSS feed reader. And, of course, there were some in the room who had never actually read a blog and needed that kind of help. Anyway, it was a fine presentation, but I just kept thinking "Six years. Six years. Six years." A brief thought did occur to me, that if nobody said anything about me declaring The League was done and over with, I was going to feel pretty darn bad. I've heard of this happening with cartoon strips ending, etc... The creator sort of fantasizes about complaints regarding the end of the series, but then not a single letter comes in. I am glad that I read about that at a young age. It's best to set expectations for yourself. DC Comics launched a blog, by the way. Lauren is still recovering at home. Still on liquids. We're wishing her well and hoping she's on the mend. And, of course, Steven is doing a fantastic job making sure she's a-ok. She's not back to break dancing speed yet, but I have faith we'll see her headspinning shortly. Anyhow, Nicole has stepped up and reported in this evening. She's got Matty's back. There's a coffee shop now in the PCL where I work, and as I do not function without coffee, they see me every day. Which means I'm friendly with the staff. I had to admit to them today that I was old enough to remember when Thriller was released (they were listening to the album and asked if I knew "the Thriller dance"). I watched their eyes as they mentally did the math and then become sad for me for being so close to the grave. Still, they promised me a lifetime of free coffee if I actually performed the Thriller dance. I'm a fan of shopping where people know me, and its a rarity in this day and age. The Austin Books guys know who I am, which is nice, but as I don't hang around the store, they don't exactly know me (well, Brad does). Part of the curse of only showing up once a week for about fifteen minutes, I guess. But I'm also happy that Austin Books is healthy enough that they aren't going to know every dude who walks in the door by default. New Flash out today, by the way. Seems off to a good start, which The Flash sorely needed. 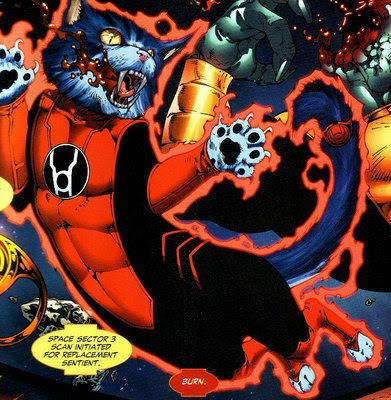 It's been mostly not-good since 2005, but I'm sort of a Flash nut, so I hate to give up on the Scarlet Speedster. It's tough to explain what happens in serial comics as writers come on and go off the title, and add their own little bits. But its also nice to know that Geoff Johns has made a hell of a career for himself by knowing what works and doesn't, and getting it all sort of straightened out through the actual story-telling. And he laughed under his breath like a maniac whenever The League was outnumbered. Throw in some Van Sciver art that's above and beyond even what I'd expect (and I was expecting some good stuff), and it's worth the price of admission. Anyway, yes, if you're playing catch-up and haven't read a comic since the 1980's, Barry Allen will be the Flash in the newest series. I don't know if I'm going to be as okay with all the explaining Lost is going to have to do as I thought I was. I have a bad feeling the last two episodes will feel like the final five minutes of the movie "Clue". I'm also still enjoying "Kings" on NBC. 6 Years. Almost 3000 posts. March 30, 2003 I wrote my first blog post here at LoM. We're dangerously close to 3000 posts (the counter says 2995, but that's misleading), so that should give a good indicator of our rate of posting. Six years. 3000 posts. Where's my gold watch from Blogger.com? In blogging lifespans, I'm a frikkin' methuselah. I've not raised and lowered the boom on a number of blogs. Its just been six straight years of the same-old-same-old. It's been a great run. When I decide to start a new blog, you people will be the first to know. After work, Jamie picked me up and we headed straight over to Seton NW to check in on Leaguer Lauren. I am happy to say that she's handling the situation with her usual gusto, and I would expect she'll be back to swing dancing her way across Austin again fairly soon. I also realized how much goddamn time I've spent sitting in hospital rooms just like the one she and Steven are sitting in. I've never really wanted to count the total days that I've spent sleeping in those chairs or shuttling between home and the hospital and work, eating on the road or in the greasy spoon that all hospitals seem to have for a cafeteria. And I don't think Jamie or her mother would want to tally the hours Jamie's spent sitting in a hospital bed. The truth is, there have been so many trips to the hospital, and so many trips to the ER, and so many procedures and surgeries, I've lost count completely. I can't even ballpark. That's not to detract from Lauren's stay, which is going swimmingly, save some post-op discomfort, etc... and Steven is doing his part, it seems. You just can't help but walk into a hospital room and not evaluate, assess, etc... and want to give tips on how you can proactively manage the situation, even if nobody wants to hear it. Lauren was chatty, which is the best sign possible, even if its pretty obvious she isn't hitting on all six cylinders quite yet. We saw pictures of what they saw and what they took out. Its odd to look at the innards of a pal. Its who they are, but it isn't any part of what you think of when you think of them. But modern technology gives us that amazing insight into territory folks didn't see thirty years ago without an operating lab or a cadaver. I hope Lauren comes home tomorrow, as has been suggested. But mostly I hope she feels better tomorrow and she receives the best in care. Again, Steven is doing his part, as you kind of knew he would. Juan and Letty came up, and we decamped to The Cheesecake Factory where the old Arbor stood when I was a kid until sometime after college. Letty and Juan are about to move in a week or so, so I'm watching them with great interest as they prepare the next step in preparing for Baby #1. Watched with interest as the White House made moves on the auto industry today. The part of me that's been trained to believe that this isn't how things are supposed to work is deeply at war with the part that says "if they want the money, then things must be different". I've not reconciled my opinion on this issue as of now, but don't think it's "wrong", per se. But it also unreconcilable to say that the industry can make it without the money, just as its unrealistic to believe that leaving the powers that be that got us there in the first place are going to know how to do things differently. Or that the car companies weren't going to just go under without assistance. But that doesn't mean I'm keen to go deeper into debt to resolve the issue. Or that the US should have a department worried about car manufacturing. But I suspect we'll be talking about this for a long, long time. I generally try to avoid political affiliation, not because I'm deeply private (see: the last 6 years of this blog). Rather, I'm not particularly a fan of buying into a set of ideologies that can't conform to new or unanticipated situations, or unable to change when its clear the old models aren't working. Or trying to apply a single rule to all situations, as if all situations required the same treatment. It seems it would leave one unprepared for the eventuality of the unanticipated. And its been that kind of political expediency and "common knowledge" application of the rules thats made so much of the bailout efforts so bungled. We aren't supposed to have government involved with dictating business, but if we don't support the business, huge parts of the economy fail. If we became involved, we're nationalizing and becoming something we don't want to be, but if we don't place rules (as has happened with criticism surrounding AIG, etc...), then we're being irresponsible. It's a no-win. But everyone agrees SOMETHING must be done. Its just that everyone has a different opinion, and everyone is sure that the rules with which they arrived at the party are the right ones. Its a bit like those scenarios in movies where they have to pause and someone has to declare "gentlemen, we're in uncharted territory...", and then nobody says anything for a beat or two before they cut scene. I have no idea how any of this works. But I'm willing to see a brand new, previously unthinkable plan at least tried. Because we sort of know the consequences of doing nothing, and/ or doing what we were doing, which wasn't helping. At all. And, hey, if we never tried new things, we'd all still be going to the barber for a good bleeding every time we got a sniffle. We apologize if we've been a bit negligent in our duties here at League of Melbotis. Last week was chock full of busy-ness, Jamie was fighting off a cold, and I'm old and I get tired. Saturday was given over to the astounding brand of capitalism that only Ikea has managed to pull off without enraging the populace. How they've trained us all into herding through their mouse maze with all the tidbits of cheese at every step is beyond me. I think its because we know there's a cafe in the middle of maze. And its not just shopping there that's at least an hour-long endeavor (and that's if you want one item, like we did). There's also the "okay, its home... oh, yeah. Now I lose half-a-day assembling this thing" that we went through. (We got a TV cabinet/ armoire for the bedroom). Probably the part of me that's emasculated by my utter lack of skill with power tools, carpentry or generally being handy likes the faux-sense of accomplishment of putting together furniture held together with cams and dowels. I also finally got to read some comics, which I haven't really ahd opportunity to do the past few weeks. I know... poor me. Sadly, Leaguer Lauren has been laid low by a bout of the appendicitis variety. It seems she and Steven have the situation well in hand, and Lauren is on her way to being her normal, healthy self. Nonetheless, hospitalization is never fun and we at The League of Melbotis offer her our most heartfelt hopes for a speedy recovery. It sounds like they've had a good experience so far with doctors, the hospital, etc... which is so important when you're dealing with the mysteries that come with a sudden illness. This evening we met up with Mangum and caught the latest in the line of "Bro-Mance" comedies that have become so popular in the wake of the Apatow onslaught, "I Love You, Man". Its a reminder of how much comedy has changed in the past ten years or so that the movie didn't feel the need to have any character reveal themselves to be some sort of psychotic nut, which was pretty much always the path taken during the height of the Jim Carrey or Mike Myers years (think: "The Cable Guy" or "So I Married an Axe Murderer"). Instead, like a lot of recent comedies, the script seems based in familiar territory with people who are just better written than most conversations you'll wind up having with your pals. Also, you don't tend to go through entire arcs of a friendship or relationship in 90 minutes. While it works on a certain level and doesn't stoop to the antics that wore me out on Jim Carrey, the movie wants you to love the characters so much that the movie felt oddly conflict free. Which, while the plot is mostly there upon which to hang gags, it might have done the script a bit of good to feel there was some threat to someone somewhere, to get you hooked in. And unlike Forgetting Sarah Marshall, there's a tragic lack of puppets. Its hard not to feel the movie is formulaic, even if you can't put your finger on the bro-mantic comedy formula quite yet. Not to say it isn't a funny movie, but it falls into the "sure, I saw it once... not sure it'll be funny again on a second shot" category that I feel especially Seth Rogan movies tend to fall. I'm being hard on it. The movie is fine. Just nothing I'd buy on DVD. And it has Rashida Jones, which is always a huge plus. I'm sorry... somehow I stumbled upon a show called "High School Reunion" and its featuring people from Chandler High School, which was about two miles away when we lived in Arizona. How weird. I didn't attend my 10 Year Reunion, and I am unsure what force on Earth (aside from Meredith's insistence) would get me to our... what's coming up? I guess the next will be our 20th. WOW. That's... terrifying. But the show seems to be tossing people back into the mix and by making it a "reality show" situation (aka: removing the participants from friends and family and putting them in a resort where they march them through games of some sort) these people are essentially picking up where they left off 20 years prior. And... she's crying. I guess its not fun. Oh, wait. Hugs. I thought having a beer and trying to remember who people were sounded like a chore... Plus, the fact that I'm considerably... ahem... larger and in charger than I was in high school is not really something I feel like dealing with. I'll stick with the folks who know me as a Grande-sized Ryan. Hope your week is looking good. I'm headed for Minneapolis next weekend for work, so if I suddenly go AWOL for a while after Friday, you know why.